HOTEL TRANSYLVANIA is the delightful sequel to the charming 2012 kids animated movie. It brings together most of the creative and voice team of the original for a story that feels organic in its progression. In the first film, Dracula (Adam Sandler) struggled to accept that his beloved daughter Mavis (Selena Gomez) had fallen in love with a human interloper (Andy Samberg) in his monster hotel. In the sequel, the kids have gotten married and Drac is a grandpa to cute little Dennis. Problem is, Dennis doesn't appear to be a monster at all. And so, a concerned Mavis wants to take him to live in the human world, much to Drac and his son-in-law's horror. For much of the movie we see Drac take the kid on a road-trip to discover his inner monster, with laughably negligible impact. Turns out the monsters aren't really that monstrous anymore, partly through old age, and just plain old assimilation. Pretty soon, Drac comes to believe that Mavis is right. But at a last hurrah birthday party for Dennis, Drac's father Vlad (a brilliant cameo by Mel Brooks) comes to town. This infamously hard-ball monster is aghast that his son-in-law is human, just as the human grandparents are happy the kid is "normal". There's lots of social commentary in here about the difficulty of being accepted as a mixed-race or non-straight kid. The difference between tolerating something and truly accepting it. The difficulty of being understood by both sides and the pressure to please parents and grandparents. And that's to be applauded. But aside from all that, the movie really works at the level of great animation, and superb imaginative comedy. The scenes of vampire bat flight are beautifully animated, and there are some lovely throw-away visual jokes (such as Drac giving the Invisible Man a purple nurple). Finally, what I love in this movie, as in the original, is its heart. This is just a straightforwardly joyously warm-hearted movie that makes you want to hug your family and embrace glorious diversity. Kudos to all involved. 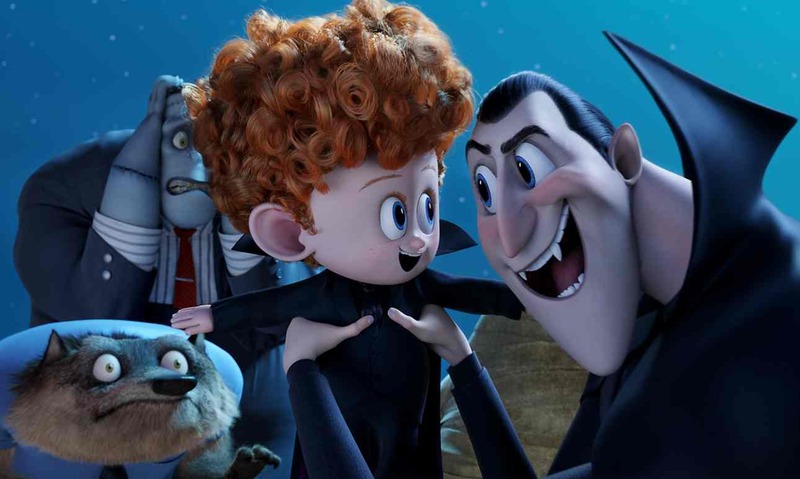 HOTEL TRANSYLVANIA 2 has a running time of 89 minutes and is rated PG. The movie is on global release.